What does a family mean to you? The family is an important source for your identity but, for some, it is a yoke to shake off. Veteran author Seo Ha-jin, 48, has recently released a book titled "A Good Family," which seeks to explore the meaning of family today. The family is not a new theme for Seo who has written six novels over the last ten years since her debut as an author. She mostly portrayed the middle class crises through the disruption of families and clashes of desires in her major works such as "Scent of Lavender" and "Yacht." In the works, she divulged the hypocrisy and fatigue of the family system and marriage through middle-aged men and women's deviations. However, in this book, she turns a more sympathetic eye on the value of family, different from her cynical and sarcastic views in previous works. But don't let the title mislead anyone. The families she talks about in the book are outwardly disguised as "good faces," to keep the family ties and solidarity, struggling inwardly with conflicts. The book consists of eight short stories with different episodes in which the author tries to understand the disharmony and conflicts, and cure them with the family's patience and sacrifice. The author expresses the efforts of family members who have to suppress their desires to maintain their household. The title story, "A Good Family" depicts a mother's busy day in apologizing for her son's involvement in violence with other students to their parents as the wretched and shameful mother; as the fearless and bold wife against her husband's company's director who made him quit his job; taking care of her daughter who participates in a protest rally; and taking care of her mother who suffers from Alzheimer. She is willing to play all these different roles to protect them within the boundary of the family. "What Does Sadness Grow to Become?" shows a typical tragic family story in which one day, a devoted mother, Hee-suk dies from ovarian cancer. 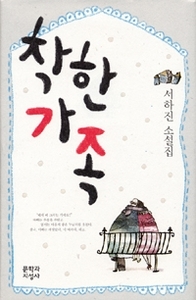 Like other similar novels, Hee-suk endures all her sadness and pains for the peace of the family. Her sacrifice surfaces when death reaches to her, making the family realize how much she endured as a housewife, a good mother, and a daughter-in-law. In "Privacy of My Father," a daughter chases her father after noticing that he might be having an affair. The daughter travels incognito with her friend to Hong Kong to follow her father traveling with a woman. The daughter reveals embarrassment when trust toward her father breaks down at first, but later she acknowledges his hidden desires as a man not as a head of the family. She is surprised to see her father, who didn't like ice cream, lick it like a child, smiling with the woman. Returning to Seoul, the daughter keeps silent and feels even "sympathetic to the father" rather than denouncing him. Another story "Where Does Everybody Go?" tells a man's internal changes after finding he has a tumor on his back. The man who was poor but married to a rich woman has lived in a separate room from his wife for ten years �� indifferent to her and his family. He doesn't become aware of relations with his wife and family until he explores the critical moment after undergoing surgery to get rid of the tumor and is warned that he could die if the tumor turns out to be malignant. The stories don't exaggerate characters but portray their different faces changing with the environment calmly and coolly. "A Good Family" might underscore the reality of "disguised roles" in maintaining a family in society, which is defined as destiny, the author says.